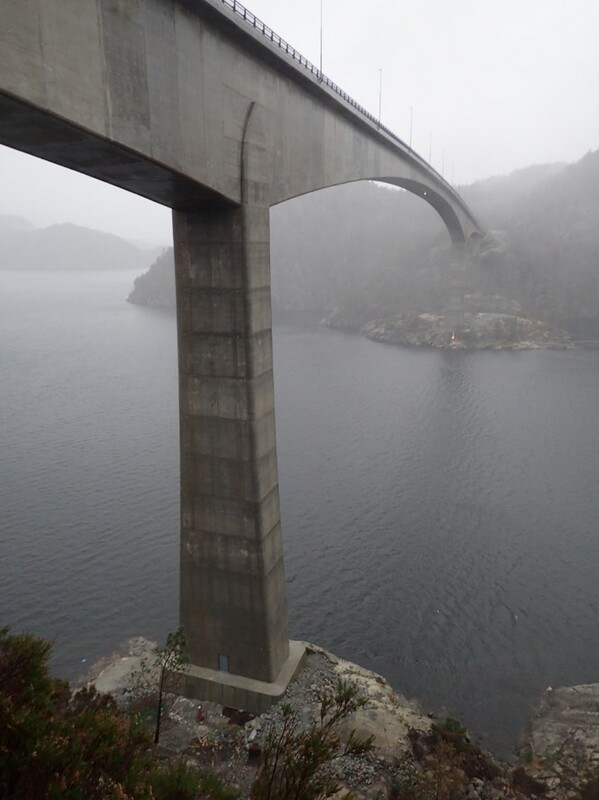 Sandsfjord Bridge is a concrete balanced cantilever bridge for Rv46, a dual carriageway in Rogaland county. It replaces the Sand-Ropeid ferry connection. The sections are part of the National Tourist Routes. 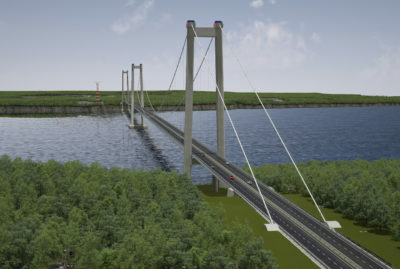 Aas-Jakobsen has acted as the lead consultant for the Norwegian Public Roads Administration both in the early phase and for the construction plan. 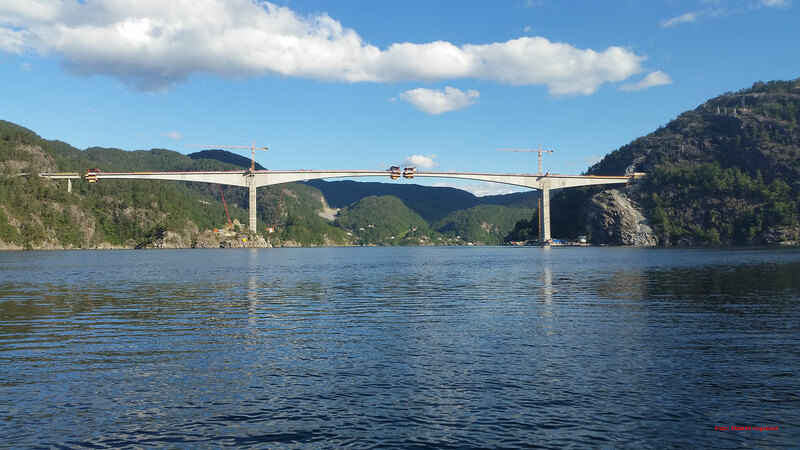 Engineering design was performed in partnership with the Bridge Section of the Norwegian Public Roads Administration’s western region. The bridge has a main span of 290 metres and has a total length of 580 metres. The bridge was built with 2 cantilever axes and a side span of 33 metres. The total heights of the cantilever pillars are 50 metres (axis 2) and 44 metres. 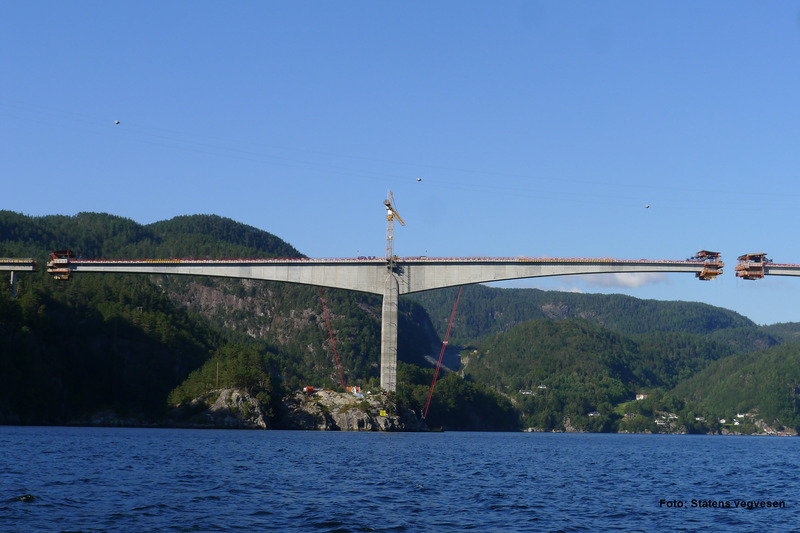 The high pillars, combined with the long cantilever construction, are pioneering, not just in Norway but also globally. The superstructure is designed as a box cross-section with two vertical stays, mainly constructed in high-strength lightweight concrete. The box section height varies from around 14 metres to 3.5 metres. The pillars are designed as rectangular box cross-sections. During the engineering design and construction phases, extensive technical wind studies were performed. As a basis for the engineering design, local wind measurements were made, and wind tunnel testing carried out. The results of these enabled the bridge to be built without traditional support columns. The cantilever from axis 3 was stabilised against vertical movement using temporary stay cables anchored to the rock. 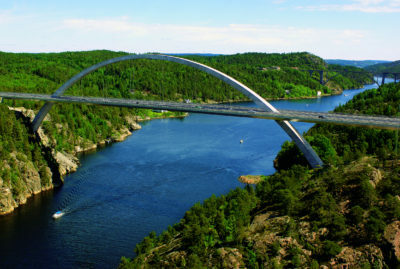 Sandsfjord Bridge gives the region an efficient transport artery. 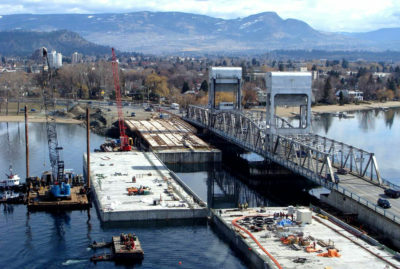 The bridge looks good in its location and is perceived as a tall, slim bridge. Building cost ca. 232 MNOK.